For a long time, I’ve been harbouring a secret. A great big, dirty secret. It turns out that the world is a hostile place...for a 3D sceptic. I finally confess, I’ve been suffering from a mammoth case of 3D cynicism. Symptoms include: belligerence or smugness when confronted with the words ‘Imax,’ ‘depth perception’ or ‘Piranha 3D.’ Victims can often be found in a verbal stupor, repeatedly protesting that ‘It will never be more important than the writing! It will never be more important than character developmeeeeeeent!’ Cure: as yet unknown. 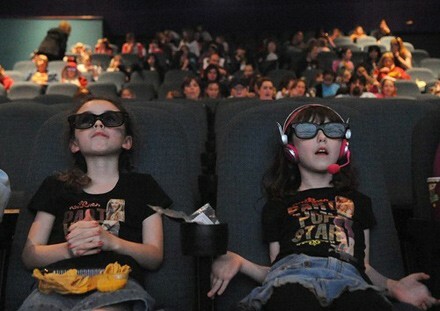 3D film is undoubtedly the future of cinema. Blockbusters like the recent sci-fi epic ‘Prometheus’, or the upcoming fantasy film ‘The Hobbit’ are clearly attesting to this. The rash of reworked and repackaged oldies (George Lucas, I’m looking at you) making it back onto the big screen, in three shiny new dimensions, is proof that people love the 3D experience. 3D films are going to get bigger, badder and more unbelievable. With the increasing popularity of 3D televisions, 3D Blu-rays and even 3D games, it’s becoming pretty clear that 2 dimensions, bad, three dimensions, super. But is it really true? Is 3D cinema really all it’s cracked up to be? After months of incessant ribbing from 3D-loving pals, I finally stepped up to the plate and bought a ticket for my first 3D film. Admittedly that film was ‘Pirates of the Caribbean: On Stranger Tides’, a movie so devoid of wit or plot that even the inimitable Mister Depp couldn’t save it. But having been promised a smorgasbord of visual treats so juicy that even the biggest cinematic stinker would be transformed, I dived in anyway. And I was truly, undeniably impressed. For about four minutes. I watched the specially made 3D trailers open mouthed and unbelieving. Brightly coloured balloons shot from the cinema screen, a catapult was fired and I flinched as its missile seemed to speed towards me. For four minutes I sat glued to the screen. And then the film started, and I realised my mistake. After 136 minutes of watching actors find inexplicable reasons to point a sword or a finger into the middle distance, I worked out just why the promises of 3D film are so empty. Not every frame of every shot can be designed to achieve three dimensional wonder. So what a 3D film actually gives an audience is maybe 40 minutes (if you’re lucky) of visual spectacle, and 90 minutes of having to watch a regular movie wearing dark, uncomfortable spectacles. And if like most lovers of 3D film, you’re thinking that a movies entertainment factor is directly linked to its levels of action, you’d probably be right. The more action in the movie, the more exciting the 3D effects, that’s just common sense. And this, my friends is where it all goes wrong. The 3D phenomenon is bad for cinema. It’s a death knell for dialogue driven films, for films that don’t rely on explosions or sword fights. Now I don’t mind a good action movie. Die Hard, Lethal Weapon, The Bourne Identity, they’re all corkers. But the real masterpieces, the shining golden nuggets of cinema that stick with a person, are those that 3D is bound to destroy. Transformers, Alice in Wonderland, Avatar; they may look impressive but are they any good? Strip away the bits where the blue man inexplicably swings his way out of the screen. Get rid of the technical glitz and CGI, the 3D bells and whistles, and what are you really left with? You’re left with poorly written stories, paper thin characterisation and more action sequences than sense. Imagine how much easier it is to make a hit film if visual ‘dazzle’ is all that’s necessary? I mean come on, Piranha 3DD? Has 3D cinema not inflicted enough evil upon the world?